(Lanka-e-News - 18.Feb.2018, 10.00PM) President who until the end did not follow the advice and warnings of the Ven. Mahanayake of the Malwatte chapter ,not to create confusion and chaos in the country and thereby destabilize it , finally came to his senses after trying to plunge the country into another trauma today. The president who did not heed the anusasana and warnings of the Ven. Mahanayake who requested him to adhere to the people’s mandate he received on 2015-01-08 and again in August the same year , finally after trying every trick abandoned those. The president who did not want to hold parliamentary sessions on the advice of the UPFA M.P.s decided to close the sessions tonight , and got ready to issue the relevant gazette notification by making arrangements to print it. The Government Printing department was also instructed to be prepared. 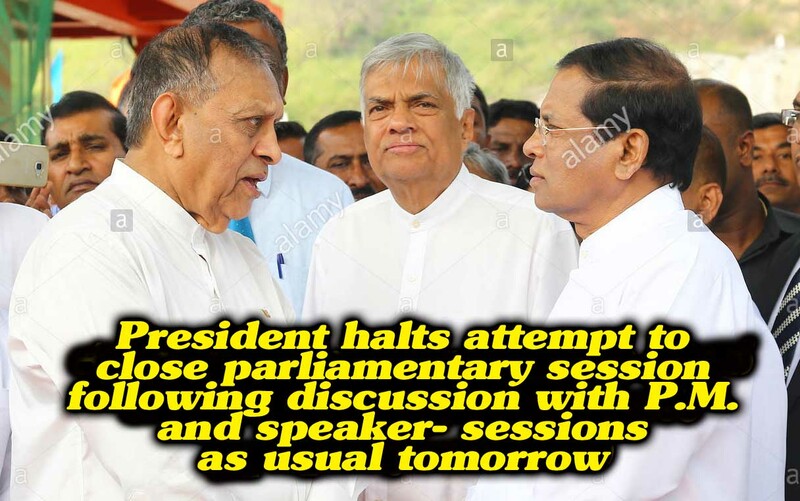 However ,after P.M.Ranil Wickremesinghe and speaker met with the president and explained the possible evil fallouts , and what peril the country will face , the president retracted his decision to close sessions , and the parliament is therefore to meet tomorrow as was scheduled. Accordingly the necessary steps have been taken . The three of them have also discussed the proposed cabinet reshuffle. Their discussions concluded a while ago , and right now the Parliamentary UNP group is enjoying dinner with the participation of P.M. and the speaker. Incidentally the UNP parliamentary group meeting was held this morning. The Parliament is to meet as usual tomorrow . While there are no doubts about the majority power of the P.M., at tonight’s final discussions among the three of them . The media reports that the president during the today's discussions asked Karu to accept the post of P.M. is a lie. There was nothing discussed in that regard , and the stance of Karu is , not only the president even if the UNP desires him to accept the P.M. post , at this juncture he will not accept that . Based on reports reaching Lanka e news , a no confidence motion cannot be brought in parliament against the P.M. under the laws. If a no confidence motion is contemplated it can only be against the government and not P.M. It is however an issue whether those who are within the government can bring a no confidence motion against the own government. No matter what , the P.M. had informed the UNP parliamentary group , tomorrow he will be taking measures as the head of the government to forge ahead. The media reports that P.M. had discussions with a UPFA group including its secretary too is untrue. On the contrary the UPFA by evening today had driven itself into a dilemma – not 113 even 95 is unsure. In fact the SLFP gen. secretary Duminda Dissanayake is not in favor of the consensual government being brought to an end . This has had a great impact. It is to be noted never did Duminda Dissanayake act against the mandate of 2015-01-08 , and even on the election platforms at the last elections , he never criticized the UNP which is the main constituent party of the government . He therefore deserves to be lauded for his sane and sensible thinking. Owing to this those who tried to form a separate UPFA government had to at the final stages seek discussions even with the TNA with a view to enlist their support . TNA of course had disagreed. Indeed a section of the alliance had not been well disposed towards appointing Nimal Siripala as P.M. according to reports . It was their view they will not support anyone else except Mahinda for that post. Sadly however because of the myopic attitude and stupid conduct of president Sirisena for the last over a week , the country’s stability was put in jeopardy , with the result , the rupee value declined , and the stock market crashed. The foreign investors who had not signed the final agreements had withdrawn their investments . At least at tomorrow’s parliamentary session , an intelligent team led by P.M. would reverse this sad state of affairs it is hoped.